Currently there is a gap between what students at the secondary and post-secondary levels are learning about human rights violations, and what is being done to stop them. Many humanities’ classes and curricula have genocide and human rights as a unit, but assess their students using traditional assessments. 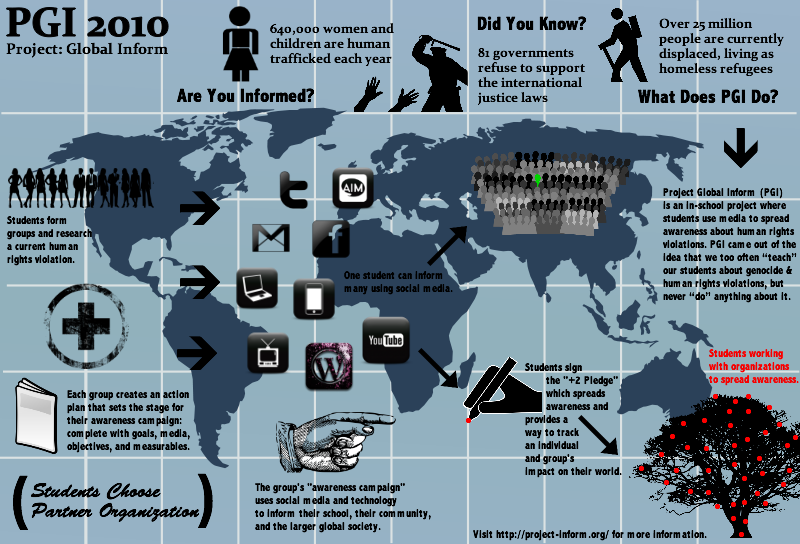 In 2008-2009 a group of students in my 10th Grade English class asked the question, “Why do we learn about all of this stuff (genocide and human rights violations), but never do anything about it?” This question sparked an idea and Project: Global Inform (PGI) was created. The students picked their own groups and researched current human rights violations. Each group picked a violation they felt particularly passionate about and began to develop an action plan. Their action plans allowed the students to judge how effective each method of media was at spreading information and creating awareness. At the end of Project: Global Inform’s first run, hundreds of people had been met face-to-face with information they did not know, while thousands of other teens and young adults saw videos, visited websites, and became Twitter and Facebook fans of media meant to create awareness. Project: Global Inform takes a peace education unit found in many schools (human rights violations and genocide) and infuses it with technology, experiential learning, and student-driven instruction. PGI has recently been developed into a non-profit organization that focuses on getting the project in as many schools as possible. As founder of PGI, I have had the unique experience of seeing first hand the impact these students have had on the world around them. ProjectGI is a 21st century experiential project. First and foremost, students use technology and social media to create “awareness campaigns”. Instead of merely “learning” about human rights and genocide (which almost every school in American has a unit on) ProjectGI challenges students to “do” something about these violations. Students, teachers, administration, community members, and non-profit organizations all work together during this project-making it a true global learning experience. If you’d like to learn more about Project: Global Inform, click through the presentation below and download the curriculum here: PGI CURRICULUM. I would like to incorporate this in my classroom but the link to the curriculum won’t work. If you email me (kseabaugh@stcmo.org), I can send you the stuff I made as well.